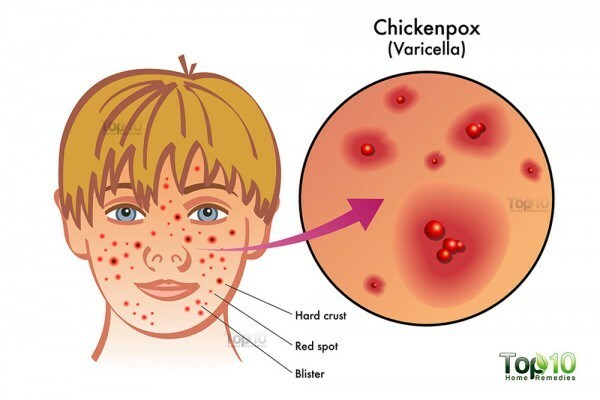 Chickenpox is caused by the virus known as varicella-zoster and spreads easily from one person to another. This disease can spread through air or contact with saliva, mucus, or fluid from blisters of an infected individual. The infected person is contagious from a day or two before the rashes appear, until the time when all the blisters have dried. It usually takes 10-21 days for the symptoms to develop the symptoms after being exposed to the virus. The most common symptoms are an itchy rash and red spots or blisters all over the body. Other symptoms include fever, fatigue, loss of appetite, and aching muscles. Because most people get vaccinated against chickenpox, it is most common among newborn babies, followed by pregnant women and people with weak immune systems. Usually, the worst symptoms of chickenpox subside in about two weeks. However, you can try some natural remedies to alleviate some of the symptoms and get relief from itching as the virus takes its course. Baking soda can help control the itchiness and irritation from chickenpox. Stir one-half tablespoon of baking soda in a glass of water. Use a soft washcloth to put the solution on the affected parts of the body and allow it to dry. Another option is to mix one-half or one cup of baking soda in your bath water and soak in it. Indian lilac, also known as margosa or neem is useful in the treatment of chicken pox as it has antiviral properties. Furthermore, it helps dry out the blisters and relieves itching to a great extent. Take a handful of neem leaves, crush them and apply the paste on the affected areas. Adding neem leaves in bath water is also beneficial. A soup made of carrots and coriander is highly beneficial in the treatment of chickenpox. It is rich in antioxidants that help in the healing process. Cut up 100 grams of carrots to get about a cup of chopped carrots and chop 60 grams or one and one- half cup of fresh coriander leaves and boil them in about two and one-quarter cup of water until half the amount of water evaporates. Drink the soup once a day for about a month. You can also eat the boiled carrots and coriander leaves for added strength. An oatmeal bath is a popular home remedy for itchiness caused by chickenpox. Grind two cups of oatmeal into a fine powder. Put the powdered oatmeal in two liters (one-half gallon) of lukewarm water. Soak in the bathwater for 15 to 20 minutes. One of the most effective remedies for treating chicken pox is brown vinegar. It will relieve skin irritation and help heal the lesions and prevent scarring. Simply add one-half cup of brown vinegar to lukewarm bathwater, and soak in the bath for about 10 to 15 minutes. Honey will provide relief from itchiness and help heal the blisters caused by chickenpox. Get a good quality, pure honey and coat the affected area with it. Repeat the process two to three times a day until the scars are gone.